(iii) Having a decent standard, of living (measured by purchasing power parity, PPP, income). The index is not a comprehensive measure of human development. It does not include important indicators such as gender or income inequality nor concepts like respect for human rights and political freedoms. But it provides a broadened prism for viewing human progress and the I complex relationship between income and well-being. The origins of the HDI are to be round in the United Nations Development Programs(UNDP) Human Development Reports (HDRs).These were devised and launched by Pakistani Economist Mahbubul in 1990lwith the purpose of shifting the focus of development economics from national income accounting to people centered policies. How does India fare in the Human Development Report of 2009,? Between 1980 to 2007, India’s HDI rose by 1.33% annually from 0.427 to 0.612. HDI scores in all regions have increased progressively over the years although there have been periods of slower growth or even reversals. The Human Development Report of 2009 pertains to figures ‘for 2007. As per this Report, India ranks 134th out of 182 nations, With an HDI of 0.612. With Life expectancy of 63.4 years we ranked f28th among 176 nations, with adult Literacy Rate of 66 % we linked 120 among 150s. Our Combined Gross Enrollment ratio of 61 % placed us at rank 134 among 177 nations and our per capita lilJp’of2753 placed us at rank 128 among 181 nations. What is Human Poverty Index? Human Poverty Index or HPI-l focuses on the proportion of people below certain threshold levels in each of the dimensions of the Human Development Index – living a long and healthy life, having access to education, and a decent standard of living. By looking beyond income deprivation, the HPI -1 represents a multi-dimensional alternative to the $1.25 a day (PPP US$) poverty measure. The HPI-1 measures severe deprivation in health by the proportion of people who are not expected to survive to age 40. Education is measured by the adult illiteracy rate. And a decent standard of living is measured by the un weighted average of people not using an improved water source and the proportion of children under age 5 who are underweight for their age . With an HPI-l value of 28.0% India, ranks 88th among 135 countries for which the index h;s been calculated. With 15.5% people not having the probability to live beyond 40, India ranks 105th among 153 countries, with 11% people not using improved water source India ranked 76th among 150 counties, with Adult Literacy rate of 34% India was at rank 120 among 151 countries and with 46% children underweight for their age we ranked 138 counties. What is Gender Related Development Index? Introduced in Human Development Report 1995, Gender related Development Index or GDI measures achievements in the same dimensions using the same indicators as the HDI but captures inequalities in achievement between women and men. 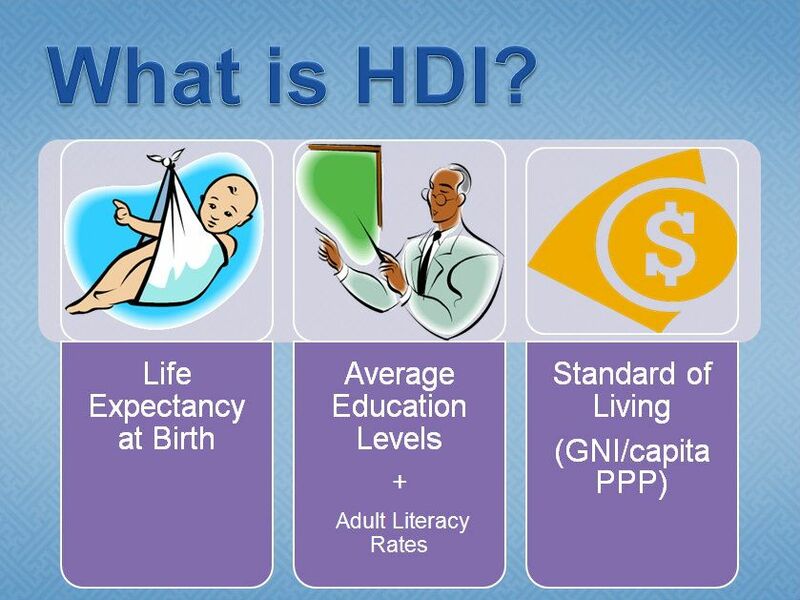 It is simply the HDI adjusted downward for gender inequality. The greater the gender disparity in basic human development, the lower is a country’s GDI relative to its HDI. India’s GDI value, 0.594 should be compared to its HDI value of 0.612. Its GDI value is 97.1 % of its HDI value. Out of the 155 countries with both HDI and GDI values, 138 countries have a better ratio than India’s. The Gender Inequality Index (GII) is an index for measurement of gender disparity that was introduced in the 2010 Human Development Report 20th anniversary edition by theUnited Nations Development Programme (UNDP). ⇒ labour market participation and measured by labour force participation rate of female and male populations aged 15 years and older. The GII sheds new light on the position of women in over 150 countries, it yields insights in gender gaps in major areas of human development. The component indicators highlight areas in need of critical policy intervention and it stimulates proactive thinking and public policy to overcome systematic disadvantages of women. Multidimensional Poverty Index was started in the year 2010 by Oxford Poverty and Human Development scheme & UNDP. It uses dissimilar factors to find out poverty beyond income – based lists. It replaces the preceding Human Poverty Index. The Multidimensional Poverty Index is a catalog of acute multi – dimensional poverty. It shows the number of people who are multi-dimensionally underprivileged & the number of deprivations with which poor households characteristically compete.